Plomosa Mountains near Quartzite, La Paz County, Arizona, USA, March 2009. The seed pods are dark purple and have long silky hairs. North of Gila Bend, Maricopa County, Arizona, USA, 27 Jan. 2019. ANNUAL: Ephemeral spring herb of the Sonoran and Mojave Deserts in usually sandy soils. Grows in years with adequate rainfall. Absent in drought years. Occasionally plants reach nearly ½ meter tall. Grows mostly erect. FLOWERS: Pink-purple pea flowers sometimes with one or more white petals. 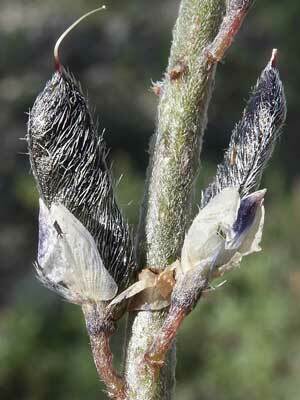 The flowers appear on a vertical spike and open mostly February to April. LEAVES: Leaves are palmately compound with the wider leaflets arranged radially. 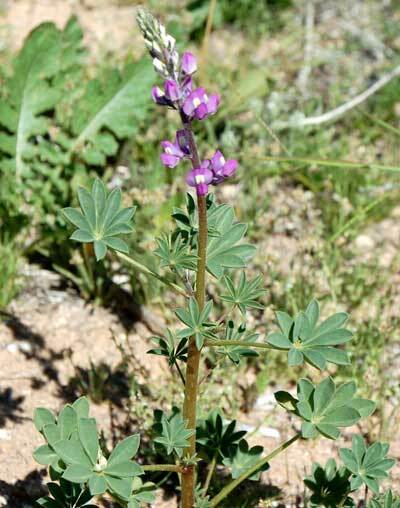 Nearly free of hairs on both upper and lower surfaces unlike Coulter's Lupine which has hairy leaves and darker purple flowers. RANGE: A common wildflower of mostly sandy soils in the Sonoran Desert in Arizona and the Mojave Desert in California and Nevada. Included in seed mixes for roadside revegetation. FRUIT: Bean capsules split open explosively as each valve twists in opposite directions - the ten or so bean-seeds are thus ejected a meter or more away from the parent plant.